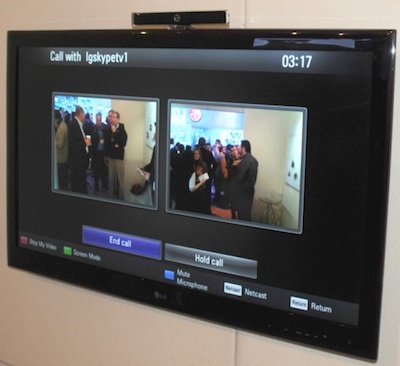 HDTV videophones have resulted from a collaboration between display-makers LG and Panasonic and Skype. Although the first generation model shown below uses an external webcam with microphone, next year's models will have these devices built-in. When a video call (or, presumably, any Skype call) comes in, you'll be asked if you want to accept or decline. Upon acceptance, the phone call will replace whatever you're watching (hopefully you'll be DVR'ing whatever you were watching). As you can see in the photos, you can blow up your caller full screen and keep yourself in a PIP, or dual a side-by-side view (yeah, that's me with a camera up to my face shooting the photo you're looking at). In the demo, the resolution wasn't great, but in the real world with a coax cable connection we're told you'll get 720p at a full 30 fps. We were also told with echo cancellation you'll have full duplex audio -- you'll be able to talk over your caller and still hear each other -- but the hall was too noisy to test this. An early reference to the videophone idea comes from E.M. Forster's 1909 short story The Machine Stops. Vashti lives alone in her tiny cubicle, never leaving. When her son calls, she agrees to "see" him. 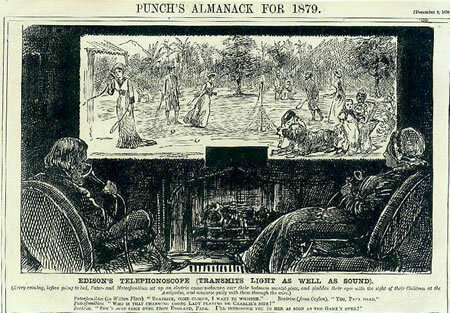 An even earlier use of this idea can be found in the Telephonoscope, an idea mentioned in Le Vingtième siècle. La vie électrique (The Twentieth Century: The Electrical Life) and other works written by Albert Robida. The same idea is used in a satiric gibe at Thomas Edison published in Punch in 1878. Fans of the great Hugo Gernsback will recall the similar (and more polished) telephot from his 1911 masterpiece Ralph 124c 41 +.